Ian Gregory will be cycling to London (with his clothes on) to then bare all and take part in a Naked Bike Ride, then cycling to Brighton (with his clothes on) then bare all and take part in another Naked Bike Ride, then cycling back to the Island (with his clothes on). Here’s how you can support him. In his 50th birthday year, Islander Ian Gregory has set himself somewhat of a huge mileage target in aid of Prostate Cancer UK, some 11,680 miles, that’s one mile for each and every man who will lose his battle with prostate cancer in 2019. Every 45 minutes of every day, of every week and every month, one man is lost to this cancer and another family is devastated. Ian has many rides lined up this year and events to help him reach this target however there are two rather special rides Ian will be taking on in early June. They are not very long rides, so the mileage for them each wont amount to much but Ian hopes they will make a huge impact and impression on as many men as possible out there. On 7th June, Ian will leave the Isle of Wight and cycle the 90 or so miles up to London once again in preparation for the next day’s ride, a naked ride, yes you did hear me correctly, naked, where Ian will bear all in aid of Prostate Cancer UK. 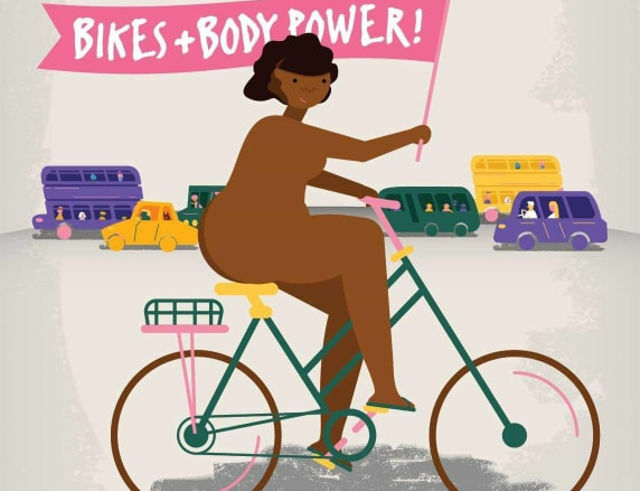 The World Naked Bike Ride London will take place in the afternoon of 8th June starting from six locations around the city and consisting of around 1300 riders. The aims of the WNBR is to promote a cleaner environment, safer roads, a healthier lifestyle and better attitudes. The event’s route has yet to be published, however typically it works its way through some of London’s most famous landmarks, including Trafalgar Square where the streets will be packed full of tourists, shoppers and I dare say some very puzzled onlookers. Riders taking part in the event are of all ages, shapes and sizes and will undoubtedly cause a bit of a stir as they work their way totally naked around London’s busy roads. Participants also use this event to promote the cause they feel passionately about and this is why Ian is braving the embarrassment and taking part. Once the London ride has finished, Ian hopes to have enough time to then ride the 60 plus miles down to Brighton, (fully dressed), to then take part in the WNBR Brighton that will take place in the afternoon of the 9th June, (date to be confirmed). Where once again Ian will strip and bear all in aid of Prostate Cancer UK. Once the ride is over Ian will stay overnight and then ride the 60 miles back home to the Isle of Wight. Fundraising here on the Isle of Wight is getting more difficult each year for Ian and his wife Jacky, as most Islanders who see the IOW Prostate Cancer UK stall see Ian pedalling some huge mileage each time and as such it has become the norm. So Ian now has to up his game to be able to persuade Islanders to part with their hard-earned money and donate to such a worthy cause. It’s only with the help of the general public and their donations that Prostate Cancer UK can fund the amazing research that is making the lives of sufferers much easier to cope with and will one day find the cure that will beat this cancer once and for all. You can make a donation in a number of ways, online via Just Giving, via Facebook, in person at one of our events or you can send a cheque direct to the IOW Prostate Cancer UK group by calling Ian on 07557 52 56 20 or email us at alltrades.iw@gmail.com for more information. The next event in aid of Prostate Cancer UK on the island is ‘Love Cabaret’ at the Wight Rock in Ryde on 16th February. This show is being put on and organised by The Cabaret Charity Club where money raised from the night will be donated to Prostate Cancer UK. 5 Comments on "Isle of Wight man to take part in two naked bike rides to raise awareness for Prostate Cancer"
I’m busy that day! BUT I’m sure John Humphrys would love to join Ian!! All those naked jiggly bits? I’m naked right now if that helps anybody.